That's the Yeti I got, both of them on the Supercharged card. 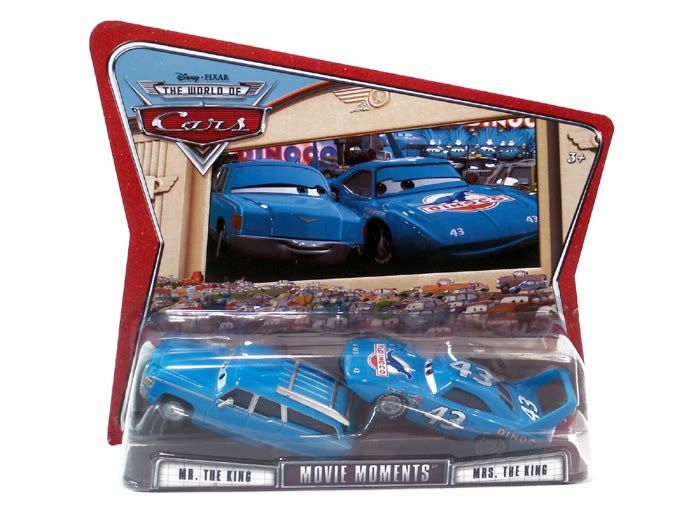 I haven't seen the "World of Cars" card yet, but as I mentioned in an earlier thread, the shelf at the local Wal-Mart was empty and may be soon stocked with the new "World of Cars" carded cars. Are Mike and Sulley exclusives to a store, i.e. Wal-Mart or Toys R Us? I've been looking for Mike and Sulley all over but haven't seen them anywhere. I don't believe so. I see them everywhere down here. No, I've seen Mike and Sully a few places, such as Target, Disneyland, Toys R Us, etc. Might just be because they are between series right now, might be a while before they rerelease them. I got the Buzz and Woody set today, but I'm surprised at how poorly Buzz is constructed. It's the removable helmet that should snap into place but doesn't. If I was a parent giving this to one of my kids I would be a little concerned about it. They should have made the helmet fixed in place or put it on a little hinge on the back. Mattel does a lot of things wrong. There are so many errors splattered across the entire line of Cars it gets tough to count! KB had a big sale and all of their cars were $3 right now which is essentially the same price as Target and Wal-Mart. mellonballer found me most of what I needed so I picked up a few for my friend's son who is also collecting these toys. I found Fred, Darrell Cartrip, and Pit Stop Guido for the little tyke. Keep your eye on your Fred... some of them were released without the license plate that says "FRED". 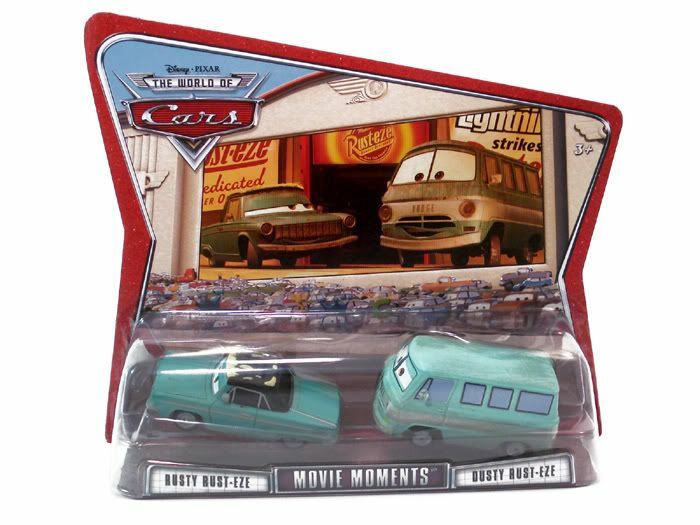 This is an error and has since been corrected but tons of cars were already sent out. The one I found today is one of those errors. Anyone seen the Flik and PT Flea set? It's the only one I am interested in with the new wave and have seen it start appearing on Ebay. Should I start hitting my Targets, Toys R Uses and Walmarts, or not quite yet? I don't think they have been released in the states yet. They were released in Europe first for some reason. I'm sure it will be soon though. I'll let you know the minute I see it. I look at so many of these things I can't always remember. I swear I saw one last month when all the stores were getting in tons, but I might be nuts. 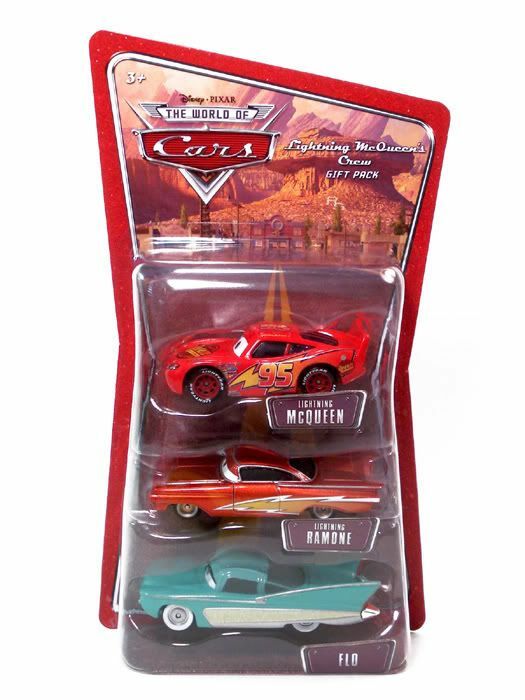 ww.rpmdiecast.com is having a Cars sale for $3 (some as low as 99cents). 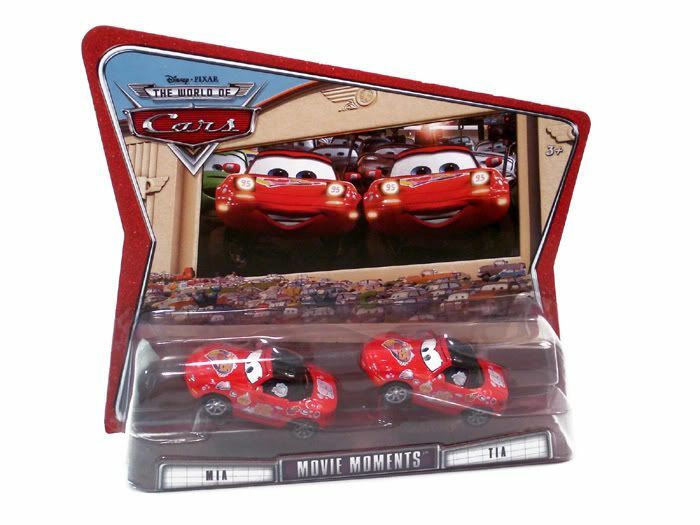 They even have the newest car OFFICIAL TOM and PIT CREW GUIDO. Thanks to mellonballer, I'm all set with all the latest cars. Mostly! You're welcome. Now only if I could find Dale Earnhardt. So I saw some new multipacks at Wal-Mart today... I picked these up for a friend since they needed only certain cars. These are about $10. 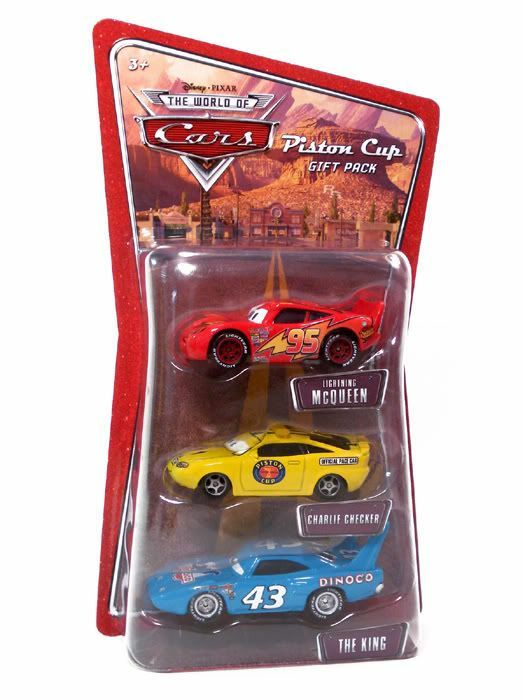 A third set comes with Lightning, Sheriff, and regular Doc with red hubcaps. I've seen those 3 packs and wondered if they were something you wanted. I'm glad you got them. Your welcome about the 2 packs. Are they going to re-release Sarge? That's a good question. Mattel may answer it at Toy Fair which is going on right now. If I see something I'll post it here. 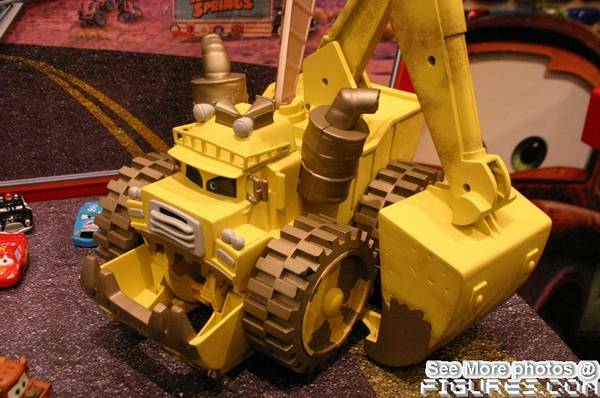 Finally found coverage from Toy Fair of Cars. The got a lot of pit crews comign out, plus the two lost minivans, a beat up The King (from the end of the race). Here is a link. holy cow this line is getting incredibly close to Star Wars in sensibilities... as in even the most background character gets a car made! And I love it! But scared for my wallet. Well Legendary Heroes has been cancelled, so that should help your wallet a little. I'm with you though, I love the fact they are doing every character. I wonder when they will get to the little kid car that wave a flag during one of the races. The Banshee... but iti's made for the mini-cars line. Looks like everyone is getting a pit crew! I NEED THIS! BUT DANGIT ANOTHER LEAKLESS?